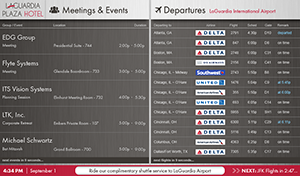 “The LaGuardia Plaza Hotel delivers exactly what active millennial travelers want, which is information in real-time,” said Scott Triphahn, Flyte Systems VP. “In one place, the property combines flight information for both NYC airports, property events and wayfinding, cool promotions, and comprehensive information on the kinds of local activities people come to New York to experience. Today’s travelers don’t like to wait, so when things happen Flyte Systems and LaGuardia Plaza Hotel are there to keep millennials informed, aware of their options.